I’m sure you have read a lot of credit card scam cases reported by the news. This is in fact a global problem and some measure can be taken to reduce this issue. Do you know some bank will send an auto activated credit card via post if it’s a replacement or new credit card? It mean anyone who can access or intercept the credit card before it reached the recipient, able use the credit card! Anyone can use your credit card which is that time without your signature, can shop till it hit the maximum credit limit. Once the bank send out the credit card, it’s deemed to be activated by default! 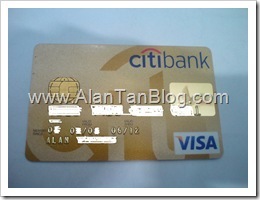 Citibank is one of the credit card company that have this highly questionable practices. I think this totally unacceptable. How can a credit card be activated by default with the assumption that it had been received by the recipient in the first place? By right a credit card should only be activated upon confirmation that it has been received by the recipient and not by any other assumption. The credit card user upon received the new credit card must be required to call the Bank in order to activate the card for the security reason. This issue must be improved and to be addressed urgently. I hope the Bank Negara Malaysia can look into this matter and issues a clear guidelines to all financial institutions on the standard protocol of issuing credit cards. This entry was posted on Wednesday, October 13th, 2010 at 9:09 pm	and is filed under Credit Card. You can follow any responses to this entry through the RSS 2.0 feed. Both comments and pings are currently closed. Only Now I know citibank have this practices. Luckily I have canceled, thought of want to reapply since they call me many times and keep pampering me with attractive deal.